I work in the kind of neighborhood that in the food and nutrition world lately has been termed a “food desert” – high poverty areas with little or no access to fresh or healthy foods. My lunch options include a White Castle drive through, KFC, or a Chinese buffet of dubious cleanliness. So, for the past four years I have been bringing my lunch to work with me. Every. Single. Day. The good news is that it saves me lots of money, not to mention hidden calories. I used to work in an affluent neighborhood and the temptation to eat lunch at restaurants multiple times a week left me with too little cash and a little too much padding on the hips. The challenge is making daily lunches that are pocket-friendly, healthy, easy to transport in a container in a bike backpack, and varied enough to not make me sick of it. This week I made chicken salad. Now, this is not your ordinary chicken salad, because those who know me know that I hate mayonnaise. Detest it. Can’t look at it. Something about the way it jiggles, the pale yellowish color (homemade mayo is even more vile in my book), and the thought and faint smell of congealed eggs sends me running. However, a little less than a year ago my boyfriend discovered a nearby sandwich & smoothie shop, Healthy Nibbles, that made a chicken salad wrap with Vegenaise (vegan mayonnaise made from vegetable oil). Not only did it not disgust me, but I love it so much that it’s the only wrap I ever order there anymore. And this is my homemade version of it, to be eaten this week for lunch with a slice of hearty rye sunflower seed bread, slices of English seedless cucumber, and mixed greens. Season the chicken breasts with a light sprinkling of sea salt and freshly ground pepper. Pan-grill them with a dash of cooking oil, being careful not to let them brown and form hard crispy edges. Chop into very small pieces and refrigerate to cool. 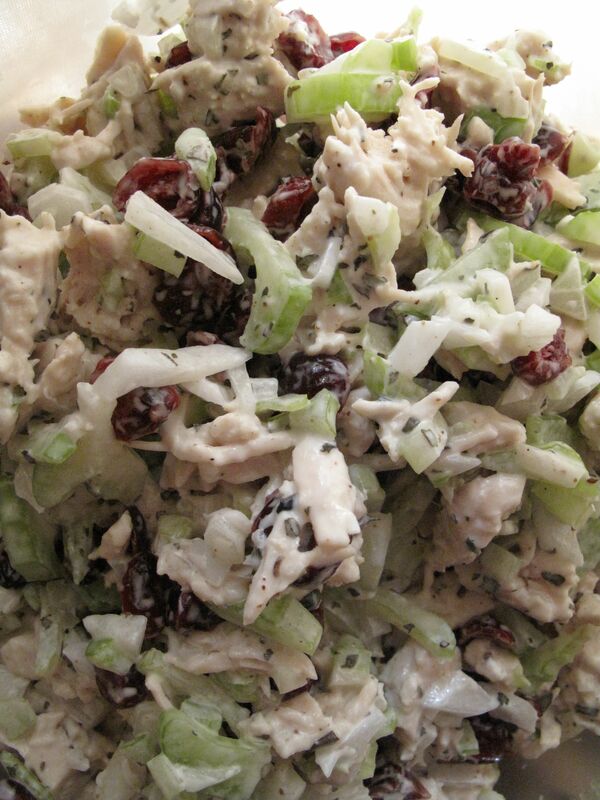 Dice celery and onion and add, with dried cranberries, to chopped chicken when cool. Stir in Vegenaise (they make a few different kinds – I used reduced fat Flaxseed & Olive Oil) and add spices to taste. This version used dried basil, but fresh would probably work as well. You could also add chopped walnuts, or a splash of fresh lemon juice if desired. This entry was posted in Cooking adventures and tagged chicken, salad. Bookmark the permalink. If you want another really good, mayo-free chicken salad, I make this Rachel Ray one all the time in the summer. The mint gives it a great, summery feel.